The Spanish rail operator, Renfe, offers free transfers on suburban trains and trams with the purchase of domestic AVE or Long Distance tickets (any fare, route or class). It is not available for Media Distancia trains. The Combinado Cercanías is a five-digit code or barcode that you'll find on eligible tickets. The code enables customers to obtain a free ticket for a suburban train (and/or FEVE suburban train) within four hours of arrival and/or departure at both the origin and destination stations. It is located in the top-left hand corner of eligible domestic Spanish tickets; see Understanding your Spanish train ticket for more detail. Eligible services include high-speed AVE or other Long Distance trains such as Trenhotel, Talgo, Alvia and Euromed (any fare, route or class). Short and medium distance trains such as Avant and Media Distancia (MD) do not include Combinado Cercanías. If your ticket doesn't include a Combinado Cercanías code, you'll need to buy tickets for onward travel on the day from machines in the station. You can collect and use your free transfer ticket four hours before departure at the station of origin and four hours after arrival at the destination station of the Long Distance-AVE train, provided the suburban railway service is open when you arrive. Simply having the code on your print-at-home ticket does not authorise travel. 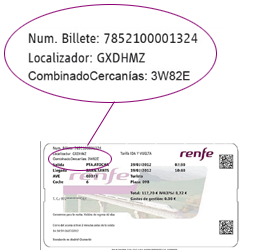 The free transfer tickets (Renfe/FEVE) can be obtained at self-service machines, which show either the Cercanías logo (most of Spain) or Rodalies logo (Catalonia only). There are a few different machines, depending on region and the age of the machines. All machines have multi-language options which you can select on the first screen. You'll need to enter your destination and choose the fare "Suburban Trains Combo fare" (tarifa “CombinadoCercanías”). Depending on the machine, you'll be prompted to enter your CombinadoCercanías code or scan the barcode (for machines equipped with a barcode reader). You'll need to do this once for each passenger. Your tickets will dispatch from the slot beneath the machine. If the station does not have a self-service machine, you can go to the ticket window, and present your ticket/s. Staff will issue the ticket for your transfer ticket. If the station has neither self-service machines nor ticket windows, you can still board the train. The ticket will be validated by the conductor on board or at the destination station. However, please note that this is only acceptable if there are no machines (the ticket inspector are aware of stations that don't have facilities). Note that Combinado Cercanías tickets do not carry the right to compensation due to incidents/delays affecting the service. Renfe: Asturias, Barcelona (Rodalies/suburban trains), Girona (Rodalies/suburban trains), Camp de Tarragona (Rodalies/suburban trains), Bilbao, Cadiz, Madrid (Cercanías), Málaga, Murcia/Alicante, San Sebastian, Santander, Seville, Valencia and Zaragoza. FEVE: Asturias, Santander, Cartagena Station and Bilbao.